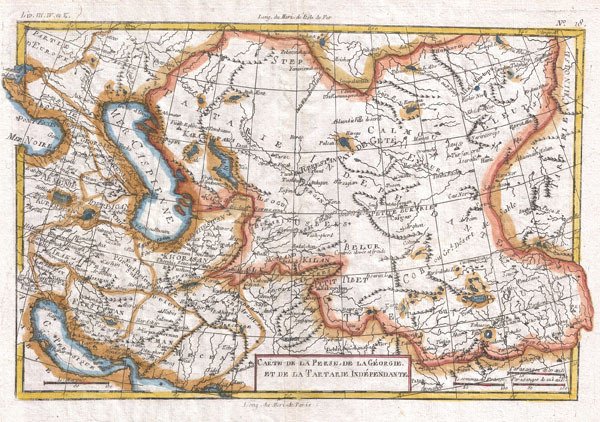 A fine example of Rigobert Bonne and Guilleme Raynal's 1780 map of Central Asia. Focuses on the region once known as Tartarie Indépendante or Independent Tartary. This name was given to the great tract of land by Europeans in the middle ages, and included the land from the Caspian Sea and the Ural Mountains to China and India. This area was originally inhabited by Turkic and Mongol peoples of the Mongol Empire who were generically referred to as Tartars. This area includes the modern day countries of Uzbekistan, Kazakhstan, Turkmenistan and parts of Afghanistan, Pakistan, Iran, Tibet, and China. Also includes the adjacent Caucases, located between the Black Sea and Caspian Sea. Drawn by R. Bonne for G. Raynal's Atlas de Toutes les Parties Connues du Globe Terrestre, Dressé pour l'Histoire Philosophique et Politique des Établissemens et du Commerce des Européens dans les Deux Indes.